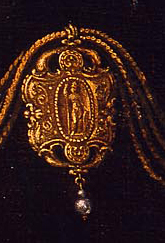 Detail of Athena pendant. Sofonisba Anguissola, The Artist’s Sister Minerva Anguissola, ca. 1564. Layton Art Collection. Full image below. It’s hard to study art and not learn something about classical mythology. The gods and heroes of ancient Greece and Rome are not only prevalent in ancient art (as in the Museum’s two Greek Hydria), but in later periods such as the Renaissance (which saw a “rebirth” of classical antiquity, which you can see in our Orpheus Clock) and the Neoclassical era (a perfect example is Hiram Powers’ Proserpine). So, for the next two months, I want to take you on a tour of the Museum Collection with mythology as our theme. And what’s fun about myth is that once you learn some of the basics in iconography, or the standard in how figures and stories are depicted, you’ll be able to recognize it in other works at other museums, and even in daily walks around your city or shopping mall. The Romans and the Greeks shared almost the same pantheon (you could say that the Romans stole the idea from the Greeks), but the Romans often used different names for the same personality. 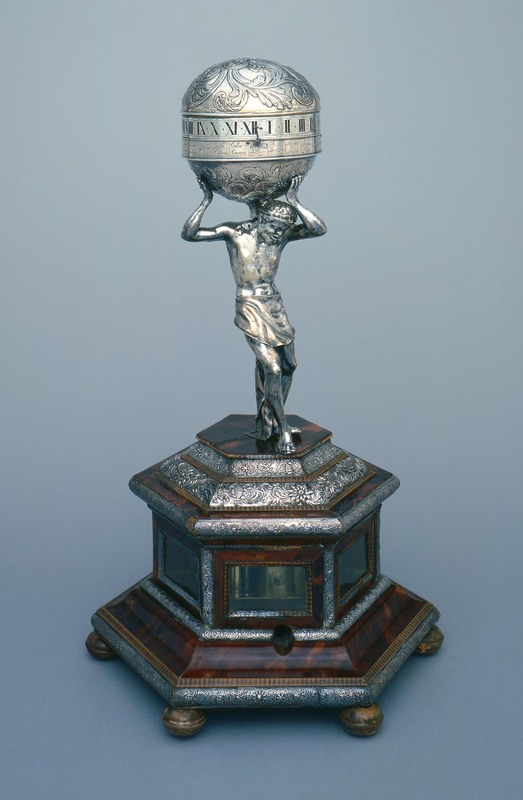 Flemish or South German, Nautilus Cup, 1575/1625. Detail. Purchase, with funds from Donald and Donna Baumgartner. The figure of Hercules can be found in Gallery #2, but you must have a sharp eye. I mentioned him in my previous blog post on the Nautilus Cup because he is one of the many figures on the setting. He forms the stem of the cup, as you can see in the photo detail at the right, holding up the nautilus shell (cup) on his shoulder. Clearly, Hercules is strong, which is one his most important qualities. But two attributes of Hercules —which are parts of a character’s appearance, usually objects—pinpoint the identification. Hercules wears the lion skin from when he killed the Nemean Lion (the first of his twelve famous labors) and leans on a gnarled club, his favorite weapon. Hercules is a popular mythological figure in art. Here is an ancient bronze in the Vatican Museums, and a portrait of Roman Emperor Commodus as Hercules (Romans loved to role-play, but that’s another blog post). Just on the other side of Gallery #2 is another familiar hero of the ancient world. A Renaissance clockmaker decided to make a thirty-hour clock in the form of a sphere, and that sphere is supported by Atlas. Atlas was a Titan who was condemned to support the heavens on his head and hands as punishment for taking part in the revolt of the Titans against Zeus. Consequently, in art Atlas is usually shown with the globe on his shoulder. You may be familiar with the sculpture of Atlas, in Art Deco style, outside of NYC’s Rockefeller Center in New York by Lee Lawrie. 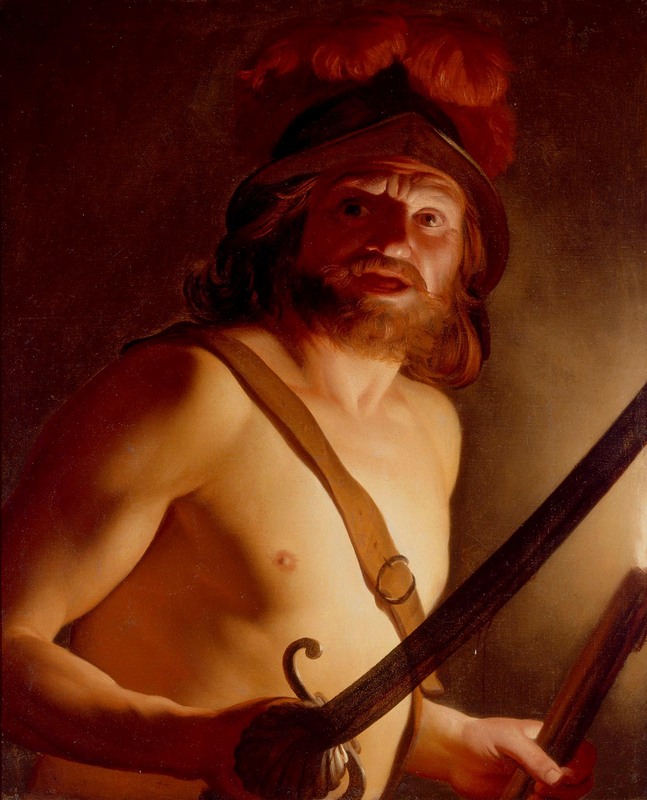 Moving on to Gallery #5, we come to a more complicated artwork: Dutch artist Gerrit van Honthorst’s Mars, God of War. 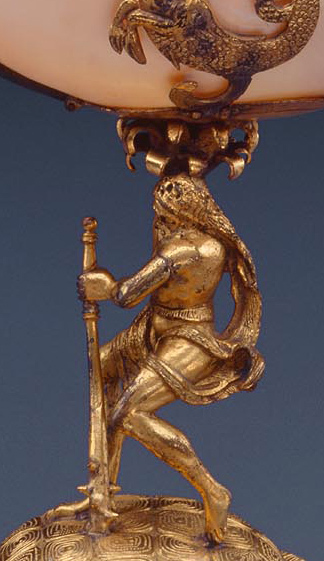 Curators have identified the figure as Mars because he has the two attributes associated with Mars: weapons (a sword) and a helmet. But admittedly, that isn’t a lot to use to make the identification. The conclusion is complicated by knowing that Mars isn’t a common subject in Dutch art. If indeed the identification is correct, and the artist Honthorst painted the sitter just as Mars, it would be very unusual. It is possible that the figure was a soldier in a religious painting, a subject that would be much more common. In fact, curators are fairly certain that the painting was cut down from a larger work since key elements of the composition are cut off: his elbow, his sword, and, most interestingly, the tip of his torch. Of course, another point in favor of the godly identification is the sitter’s bare chest. The subject of the painting is further complicated by the fact that it is very unusual to see Mars as a single figure in art of any period. The Ancient Greeks tended to avoid him because of his violent personality. In both the Ancient Roman and later periods, Mars is usually depicted with Venus at some point in their love affair. For instance, here is a great Botticelli painting showing Venus and Mars after their affair. Another painting shows Mars, in full armor, discovering a barely draped Venus behind a curtain. Only Venus can distract the war-mongering Mars from thoughts of battle! Leaving behind manly Mars, let’s go to the Italian Baroque Gallery (#6) where we find another painting with a mythological mystery. Here is an oil painting by female Italian artist Sofonisba Anguissola. Encouraged by Michelangelo and Giorgio Vasari, Anguissola became the first woman artist of the Renaissance internationally known for her portraits. She served as court painter to Philip II, King of Spain, for over a decade. 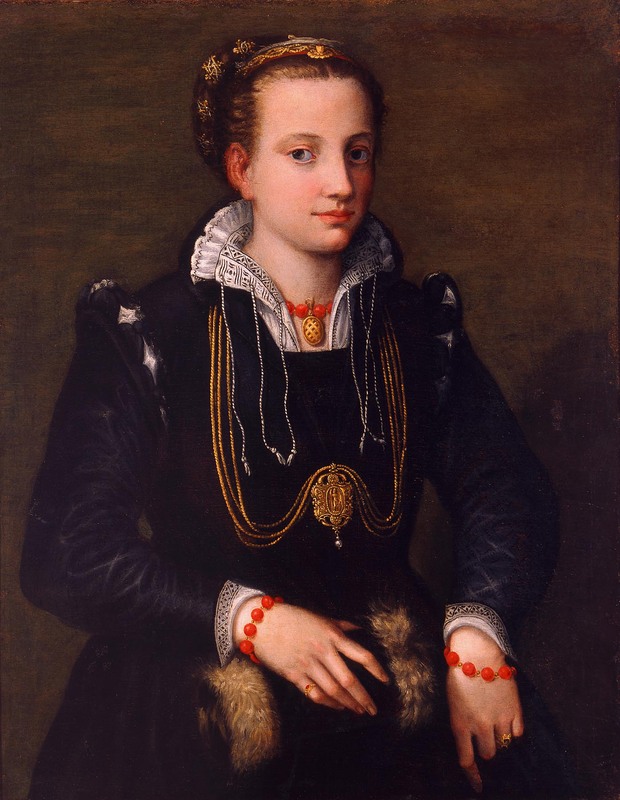 Sofonisba Anguissola (Italian, 1532–1625), The Artist’s Sister Minerva Anguissola, ca. 1564. Oil on canvas; 33 1/2 x 26 in. Layton Art Collection, Gift of the Family of Mrs. Frederick Vogel, Jr. L1952.1. Photo credit P. Richard Eells. Our painting was once thought to be a self-portrait. The real identification of the sitter was based upon some of the artist’s drawings—but the clincher was the medallion that she wears around her neck. It depicts the warrior goddess Athena. We know that because of her attributes: she wears a helmet and holds a spear, and a shield lies at her feet. You can compare the figure with this ancient Greek relief showing Athena. But how can this possible pinpoint the identity of the girl? Remember I said that the Romans adopted much of the Greek mythology but changed the names? Well, they gave Athena the name Minerva. And Sofonisba had a sister named Minerva. Bingo! That would also explain why it was originally thought to be Sofonisba herself–there would be a family resemblance. Add to this that Minerva died in 1564, which is stylistically about when the painting was made (the portrait was probably a memorial), and you have a strong argument for this new identification. So, now you should be able to name a few mythological characters when you see them. Because these are just some of the interesting stories related to mythology in the Collection, I’ll explore more next month. This entry was posted in Art, Curatorial and tagged athena, Atlas, Dutch art, European art, Hercules, mars, Renaissance, venus. Bookmark the permalink. I love this blog! I hope the lack of comments is not discouraging. Your work is the highest quality! I totally agree with Rob. Keep on this great job you are doing. Please have in mind that this blog is visited and read by many people from outside US. Best greetings from Poland.